Working with Limerick Choral Union with assistance from St Nicholas’ Schola Cantorum, we are presenting two major works in concert later this month, kindly supported by Davy’s Western Office and in aid of Cancer Care West. Under the leadership of music director Norman Duffy, the choirs will sing Carl Orff’s Carmina Burana with soloists Franzita Whelan, Gyula Nagy and Derek Moloney, and Francis Poulenc’s Gloria accompanied by organist Peter Barley. Seapoint’s upstairs ballroom is a new venue for the choir, but the larger capacity, hospitality facilities and car parking will help make the concert available to a wide audience. 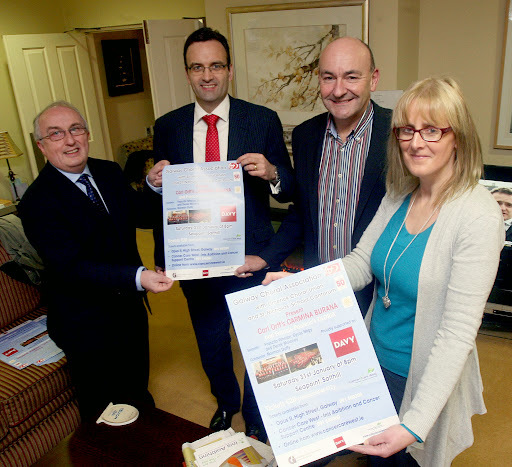 Michael O'Hare, Eoin Cotter (Davy Group), Norman Duffy and Sharon Fitzpatrick (Cancer Care West) at the concert launch. “The Gloria is a lovely work, and provides an excellent contrast” said musical director Norman Duffy. Written by French composer Francis Poulenc (1899-1963), it was premièred in Boston in 1961. The work presents the Gloria in Excelsis Deo in six movements, progressing from an accented and declamatory opening, through dramatic and joyful moments to an ending which is dark and mysterious. Cancer Care West, which provides residential and support services to cancer patients and their families in the west of Ireland, has been selected as the charity partner for the event. “We are delighted to acknowledge the support which Cancer Care West provides”, Michael O’Hare said, “and to be able to assist them to raise vital funds to continue their work”. The concert is being held at 8pm on Saturday 31 January, in the upstairs performance venue at Seapoint in Salthill. Tickets are €20 (€17 concession) and are available from Cancer Care West (Inis Aoibhinn or the Cancer Support Centre or online at www.cancercarewest.ie), from Opus II on High St or at the door.